High rise buildings have used the same elevator system for decades. So why mess with a good thing? Because that good thing is one major waste of space. Friends, it's time to redesign the elevator. With only a few exceptions*, high rise buildings use elevator designs that haven't radically changed in decades. We place a single elevator cab into a long vertical elevator shaft that runs either the full height of a building or, in the case of some very tall buildings, for a small portion of the building's full height. This means that at any given time, only one floor of an elevator shaft is in use, while all of the remaining floors are empty (and must remain empty) until the elevator cab returns to or passes by the floor again. Put succinctly, this is fundamentally wasteful. To give the discussion some actual numbers, lets take a real building. The John Hancock Center makes an excellent example, as it is conveniently, exactly 100 floors tall and has a whopping 50 elevators. Elevator shaft dimensions can vary considerably, but a reasonable size is 8x8 feet, or 64 square-feet. Now, not all elevators service all floors, so let's assume, just for argument's sake, that 17 elevators serve the first 33 floors, 17 service the next floors (34-66), and the remaining 16 service the last floors (67-100). Remember, even if an elevator only opens for some floors at the top of the building, all of the floors below are still filled with a shaft and the space is unusable, even if there is no door. So, we have a total of 17x33 + 17x66 + 100x16=3283 elevator spaces, and from above, we've estimated that each elevator space takes roughly 64ft^2 of space, which means our elevators occupy 3283x64 or just over 200,000 square-feet of floor space. In the case of John Hancock, the entire building has 2.8 million square-feet of usable floor area. So our elevators are approximately 7.5 percent of our usable space. That is a lot of unused space! * Some buildings, Like Tapei 101, use double deck elevator cabs, which help increase the capacity of a given elevator shaft. Still these are more a minor evolution than a revolutionary change. So this is what we have now: every elevator running in its own shaft, doing its own thing. 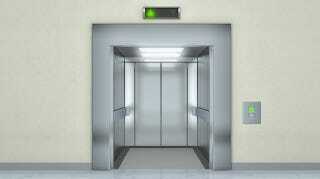 I propose breaking the elevator shaft paradigm by designing cable-less elevators cars that move in an elevator plane, instead of an elevator line (shaft). If an elevator cab were capable of moving laterally as well as vertically, we could run multiple elevator cars within a single vertical column. To do this we'd need to get rid of elevator cables and instead have each elevator cab driven by an integral motor system. If we could run multiple elevator cabs within a single vertical column, we could radically reduce the number of required elevator shafts, freeing up substantial floor space for other uses, including tenant occupancy. So we've gone from six elevator shafts to three. Of course, we can't switch to only two shafts, as we need some ability to handle peak loads—such as lunchtime or at the end of the day, when entire floors of people all want to leave at roughly the same time. But with multiple cabs, we can combat capacity issues with high frequency, resulting in comparable or better total passenger throughput. Fine-tuning would be required to determine the exact reduction in elevator shafts that could be achieved, but a solid 50 percent reduction is certainly a reasonable possibility. In the case of our example, this could mean freeing up 100,000 square-feet of additional tenant space, or 1,000 square-feet per floor. In other words, about the size of a typical 2-bedroom, 2-bath apartment in the U.S.
Of course, this would all be wildly expensive and take some serious technical hurdles to overcome—namely the increased energy needs that come from doing away with the traditional elevator counterweights. But hey—you have to start somewhere. If you had a dream team of engineers and were given an unlimited budget and were told to build something awesome (it could be anything at all), what would you propose the team build? originally appeared on Quora. You can follow Quora onTwitter,Facebook, and Google+.